Engineers across the globe have put on their thinking caps and come up with an amazingly diverse array of bathtub solutions for individuals experiencing difficulty getting in and out of a standard bathtub. Thanks to the hard work of dozens of creative companies, the global market has been flooded with hundreds of different bathtub models across a range of different bathtub categories. 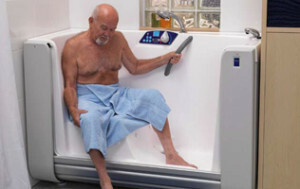 The main differences in the bathtub categories can be found in the door type (no door, inward-opening, outward-opening, upwards-opening or sideways-opening door); the entry style (walk-in, slide-in or lift-in) and whether the user sits or lies down while they are inside the tub. 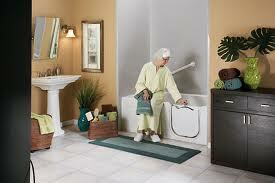 If you are seeking a more easily accessible bathtub, it is helpful to first understand what your options are. 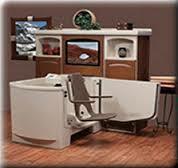 The information below provides a general overview of the types of accessible bathtubs that are available. We have highlighted a few of the pros and cons for each of the tub types listed below. The threshold to step over is lower than the height of a standard bathtub wall. A user must have the skills to walk fairly steadily, as necessary both to step in and out and to wiggle oneself around the inward-opening door once arriving inside. 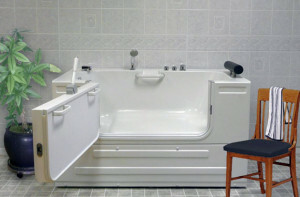 If a user’s physical strength declines further, the high tub wall permanently attached to the side of the seat can block a person from being able to access their tub at all. In the event of an emergency (I.e a heart attack), it is not possible to exit a tub with an inward opening door until the water has drained out. People can and have slipped down into the footwell of a tub with an inward-opening door and become trapped inside because their body prevented them from being able to open the door. The door opens outward which makes it possible to exit pronto if there is a life-threatening emergency. The bathroom would be flooded with water, but this is clearly a secondary problem in a life-threatening situation. 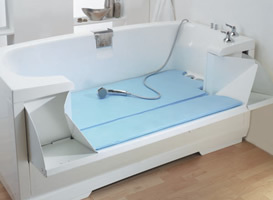 This type of bathtub requires a user to always have the skills to walk/step-in. It can be difficult or impossible to access by a wheelchair user who relies on a lateral-sliding transfer or by persons whose mobility skills are likely to decline with time, such as person’s with Parkinson’s disease or Multiple Sclerosis. This type of bathtub requires a user to always have the skills to step-in. It can be difficult or impossible to access by a wheelchair user who relies on a lateral-sliding transfer or by persons whose mobility skills are likely to decline with time (I.e. Parkinson’s disease, Multiple Scleorosis). It is possible to sit down on the seat before getting in. Once safely seated, each leg can be raised in one at a time. No “stepping in” required. 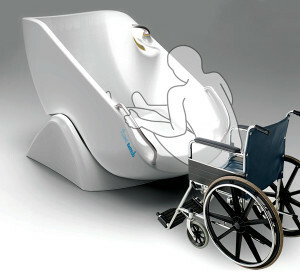 A wheelchair user can perform a lateral-sliding transfer to the tub seat. The door seal on tubs with outward swinging doors can sometimes leak over time and may need to be periodically replaced. The entire bathtub is placed at chair height so you merely need to sit down on the seat and then raise your legs one at a time into the bathtub – no “stepping in” required. It is accessible by persons who can walk and wheelchairs users. 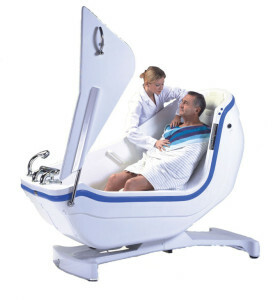 It is possible to lie down and submerge your upper back and shoulders. The toilet, vanity & other fixtures may impede the ability to open a long, outward swinging door. The door seal on bathtubs with outward swinging doors can sometimes leak over time and may need to be periodically replaced. It is accessible by persons who can walk and by wheelchairs users. 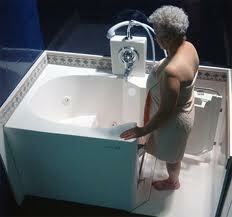 If the electrical components fail while you are inside the tub, you may find yourself unable to get out. Mechanical components will require maintenance. The entire bathtub is placed at chair height so it is possible to sit down on the seat & simply raise your legs into the tub – no “stepping in” required. 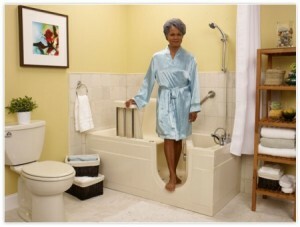 If a caregiver is involved, the increased height of the bathtub makes it easier for a caregiver to assist with bathing. You may need to pay to install an additional drain, plumbing and/or electrical components. It is accessible by ambulatory users and by wheelchair users. You must have enough upper body strength to be able to lift and scoot your bottom to the opposite end of the tub. 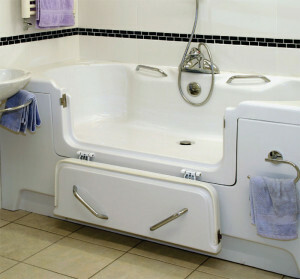 For a caregiver, it may be difficult to reach over the half-door and help a person scoot to the back end of this type of bathtub. 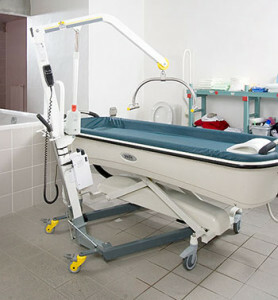 A hoyer-style mechanical lift can be purchased and used to assist with the transfers, if needed. The entire bathtub is at chair height so it is possible to sit down on the seat & simply raise legs into the tub – no “stepping in” required. 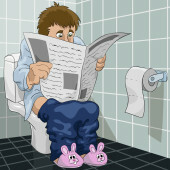 Your toilet, vanity or other fixtures may impede the ability to open/close the door. 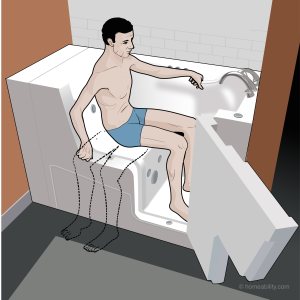 If the electrical components fail while you are inside the tub, you may find yourself unable to get out independently. Eliminates the need to “step-in”. You can sit on the ledge and safely swing your legs over into the tub. This model helps you safely transfer into the tub for a shower, but does not help you to get up/down from the bottom of the tub for a bath. 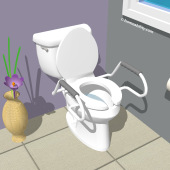 Does not allow for a lateral-sliding transfer from a wheelchair seat onto the seat inside. Eliminates the need to “step-in”. You can sit on the seat and safely swing your legs over into the tub. 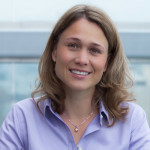 … and companies are still fast at work creating solutions that will allow users of all ability levels to bathe more independently. 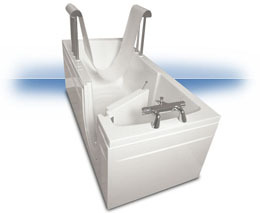 All of the bathtub solutions above involve replacing your old tub with a new one. Keep in mind that this means you will need to pay to have your existing tub removed and also pay to purchase and have the new tub installed. 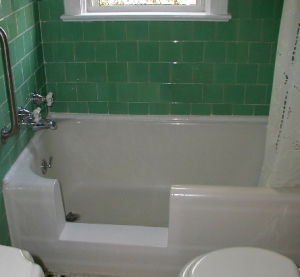 Other costs may include plumbing and electrical work, new paint, tiles or finish work around the new tub in order to make it blend seamlessly into the space where the old one resided. 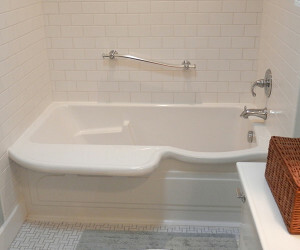 If your intent for wanting to replace the bathtub is simply to be able to get in and out more easily, and you are not interested in (or are willing to waive) soaking in the bathtub, then you might consider having your own bathtub cut to make it more accessible (see picture below). For this you will need to hire a contractor experienced in doing “tub cuts” to cut a lower threshold entrance in the side of your existing bathtub. 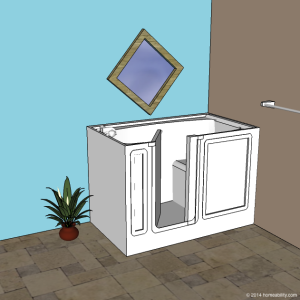 If you have a family member who does not want to give up the luxury of soaking in a warm bath, you can additionally add an insert with a door, which will make it possible for other family members to use the bathtub for soaking. If you do opt to add a door insert, the contractor will need to cut your tub to match the exact dimensions of one of the door insert solutions available on the market. Smaller threshold to step over. Much cheaper than paying to have your old bathtub removed & buying & installing a new one. Effectively turns your bathtub into a walk-in shower stall. There will still be a threshold to step over. “Soaking” in the bathtub is not possible unless a door insert is added (see below). If someone in your family still wants to use the tub for soaking, the door insert allows the tub to be used as a regular bathtub. 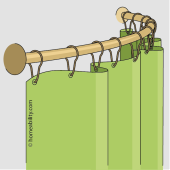 The remaining threshold is usually higher if a door insert is installed. The door opens inwards into the bathtub. If you have a tub chair occupying the back end of the tub you could find it difficult to get your legs out of the way of the door to swing it closed. If there is nobody in your home who wants to use the bathtub for soaking, we recommend to forego purchasing and installing a door insert, as it is even safer and simpler to step in without the door insert present. For more information on Tub Cuts, visit the Tub Cut Guide. 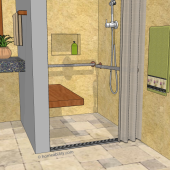 To learn about other equipment solutions that can help make it easier and safer to bathe, but do not require you to replace your existing bathtub Click Here. I confess I did not read Ms. Bonecutter`s comments before my own comment .I was so taken with the notion that finally what I really wanted was now available so I wonder why you would put the information out on the web for folks to see but cant have. If there is a manufacturer out there who are they and how do I get in touch with them. I await your response..Thank you. No offense but in the next day or so would be great. Thanks for visiting the Homeability website. As you are aware, it is a free informational site & we do not sell any products. The initial articles posted are intended to raise people’s awareness about the general “types” of solutions that are possible and to help educate people about the key benefits and drawbacks so they can narrow it down to the general type of solution that will work best. Lists of manufacturers have not yet been included for each of the general types of solutions, but will be in the future, as we delve deeper into examining each of the general product types, and the variety of models and manufacturers behind them in future articles. In the mean time, I will be happy to personally send you some information to help you get started. Being in a wheelchair limits my mobility to some degree. I do not walk or stand on my own but have no trouble transferring. My issue is the room (space) I have in the bathroom. The wall mounted motor has some degree of concern should it impede others from using the tub. I do like the wall mount as opposed to a model I saw once with the motor on the outside of the tub which would not be suitable because of the wheelchair.There is no video which is a disappointment, however I still wish to see some literature. If you have a site where the unit is better shown that also would be a plus. My wife and I are in the planning phase of our bathroom remodel. 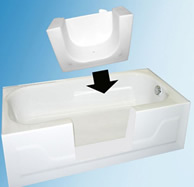 We would like to install a soaker/laydown tub where the present, 60″ X 30″ tub is located. The bathroom is small so our requirements are: Inward swinging door on the left, drain on the right, no seat, no jets. What company should we contact to purchase this style tub? Hello. Thanks for visiting Homeability. This is a free informational blog. Our goal is to help increase people’s awareness about the types of options that are available on the market and their respective pros and cons so people will be more informed when making decisions about which equipment is right for them. We don’t sell equipment or have the specs sheets for the manufacturers who do. I assume that I can buy longer shower curtains for the cut out tub without door. Yes. Shower curtains can be found in stores and online in many different lengths including up to as much as 96″ long, if necessary.